In 2008, the George A. Mitchell Co. delivered two (2) 500 TON Drill Pipe Casing Tube End Forming Machines to VAM USA of Houston, Texas. The 1,000,000 LB. End Forming Machines are the largest of their type ever produced by Mitchell. The process is very similar to Push Pointing, however, the API Drill Pipe Casing material possesses yield strengths up to 150,000 PSI. The End Forming Machines prepare, via cold forming, the ends of seamless Drill Pipe and Casing Tubes prior to machining a Premium Thread, of which VAM USA is a world leader. The accommodated tube diameters range from 4-1/2" up to 10-3/4". The machines perform one of two operations: a mandrel expansion, required prior to machining a female premium thread, and a die reduction, required prior to machining a male premium thread. 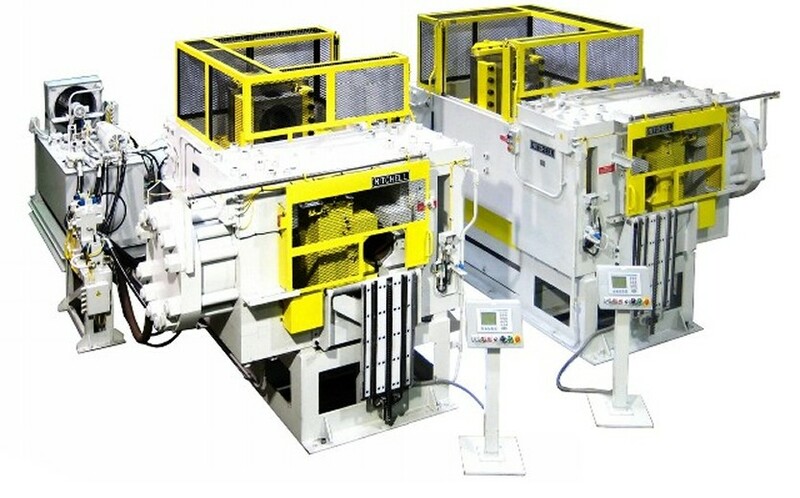 These machines were installed in a new VAM USA facility in the Houston area, in a continuous line process, which allows VAM to provide quick deliveries of the highest quality premium threads.